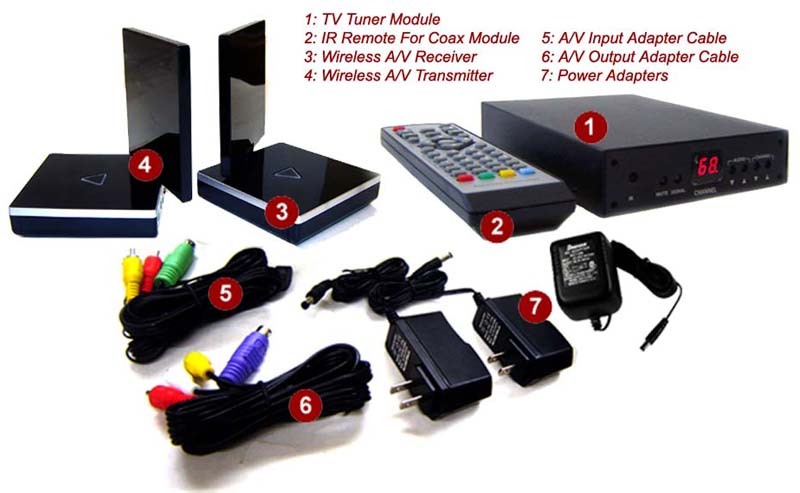 This wireless coax cable TV tuner system is designed for extending the analog RF coax cable TV signals or composite RCA video in a wireless way for home entertainment and delivering clean smooth video and great stereo sound with no noise/interference after long distance transmission. existing set top box with TV out or modulated RF port such as cable box, satellite receive, digital TV converter, media player, etc. Coax TV Tuner Module: used for converting the analog coax TV signals to composite RCA format first. Wireless Video Audio Sender Kit: used for transmitting the composite RCA A/V signals from the coax TV tuner module, in a wireless way to where the wireless receiver's location for remote TV or video projector at a distance. The coax TV tuner module and the wireless A/V transmitter kit can be used separately as stand alone devices or combined to work together for transmitting the RF TV signals wirelessly to another location. The wireless video sender kit has an IR extender so you can control the coax TV tuner, set top box or other video source devices by simply pointing remote at the transmitter. This wireless TV tuner kit also supports IR remote extender function. Users can control the TV channels from the set top box or volume levels from another room. Simply connect your coax feed to the coax input of the main RF coax TV tuner module first and then connect the composite RCA video/audio output to the wireless A/V transmitter unit. Next take the wireless receiver and the IR remote of the coax TV tuner for hookup with 2nd TV. That is all about the main setup. The main TV tuner unit in this package is a RF coax to RCA demodulator, which is a great external TV tuner module for those TVs without coax cable TV inputs or HDTV monitors with no coax inputs. The wireless A/V transmitter kit bundled in this system allows users to send video and audio signal together wirelessly to another room in the house easily without running wires thru walls or under carpets. Strong 5.8 GHz signal travels from location of your A/V source equipment through walls, floors, across the hallway or from the basement to the TV upstairs. The adjustable panel antenna built on the wireless video/audio transmitter unit and wireless receiver unit can be rotated horizontally and vertically, which is great in helping pointing the antenna toward each other between transmitter and receiver for great wireless reception and performance. This external TV tuner can be fully operated via the supplied IR remote controller or push buttons on the front panel, just like the way we were using the TV remote to flip between channels, mute the TV sound or up the volume. The wireless A/V transmitter kit can also be used alone to extend the IR remote signal to penetrate through the walls so users can control the home A/V devices at distance. Professional grade demodulator with full TV tuner frequency. External add-on TV tuner module for video monitors, projectors or DVR systems without coax inputs. Clean smooth video with great stereo quality. Decodes RF outputs from cable outlets, cable boxes or satellite receivers with TV2 out from DirecTV/ Dish Network, DTV converters, VCRs with RF out, FTA set top boxes with RF out to TV or modulated CCTV camera systems. Suitable for analog CATV signal from the cable outlet on the wall or the RF output from cable box or satellite receivers with TV2 out and FTA satellite set top boxes. Easy operation through using the supplied IR remote control or front push buttons. Record cable TV channel, satellite channel or camera channel through any standard video recorder or DVR. Excellent coax to stereo RCA audio decoder for routing the stereo sound from the TV radio channels through stereo amp, receiver, headphone, Hi-Fi speaker or home theater system. Easy replacement solution for TVs with broken coax inputs. Supports last channel memory after power on. Send clear and vivid video, stereo sound and IR remote control signal around the house without no wired connection. Sturdy enclosure with built-in high gain wireless antenna for superior wireless transmission and reception. Powerful RF transmitter built in so wireless signals can penetrate effectively through walls and floors without noise/interference. 4 selectable channel frequency for wireless transmission. Adjustable panel antenna can be rotated horizontally and vertically, which is great in helping pointing the antenna toward each other between transmitter and receiver for for great wireless reception and performance. Maximum Transmission range up to 200 feet with clear line of sight, 50 feet (through walls) for audio and video signals. Remote control signal extension up to 150 feet max with clear line of sight. Universal compatibility with most remote controllers in the market due to the wide range of IR data rate up to 60 KHz. Served as wireless surveillance system or nursing monitor when used with camcorder or other video surveillance cameras.